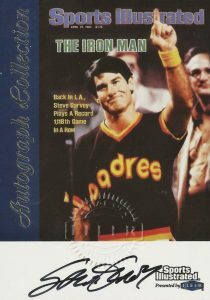 A fan favorite with both the Los Angeles Dodgers and San Diego Padres, Steve Garvey played his entire career in the NL West. Headlined by his official debut in 1971 Topps, this list includes many of Garvey's best baseball card appearances. 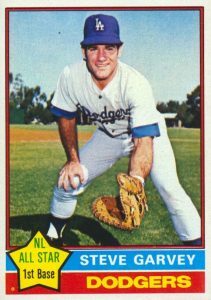 Steve Garvey covered first base for most of his career with the Dodgers and was part of the famous infield that featured Ron Cey, Bill Russell and Davey Lopes. 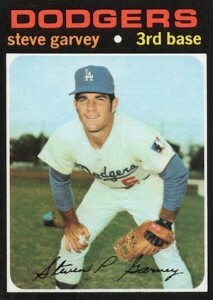 Garvey claimed four consecutive Gold Gloves and helped the Dodgers win the World Series in 1981. After signing with the Padres for the 1983 season, he, along with Tony Gwynn, brought the franchise its first playoff appearance. They would ultimately make it to the 1984 World Series where they lost to the Detroit Tigers. 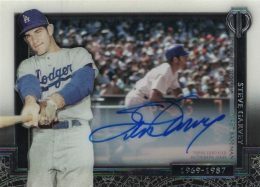 Shop for Steve Garvey autograph cards on eBay. As far as the cardboard is concerned, a rookie-year appearance for Garvey that didn’t make the list came in 1971 Dell Today’s Team Stamps, which included a special team-based album. Released later in the decade, Garvey’s 1977-1979 Sportscaster release is a great-looking card taken during an All-Star Game that features Garvey and Joe Morgan high-fiving, with Carlton Fisk looking on. In addition, boxes of Post Raisin Bran cereal from 1978 and 1979 showcased Garvey providing tips to kids on how to become a better all-around baseball player. Collectors could cut out the 12 horizontally-framed cards to complete the set. Moving to the recent hobby releases, Garvey continues to be a popular signer in baseball products. 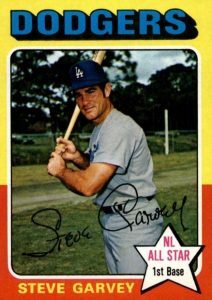 Steve Garvey autographed cards are found in 2015 and 2016 Topps Archives, 2016 Panini Pantheon, and 2016 Topps Archives Snapshots, among others. Although the Hall of Fame is still not certain, Garvey was one of the best players during the 1970s and remains relevant today. In building this list, card value is the main element along with card design. An emphasis was also put on Garvey’s earliest baseball cards. 1976 Topps was a return to a more simplistic and basic look after the colorful experiment that was 1975 Topps. Garvey is featured with a bright yellow star denoting he was an All-Star during the '75 season. In total, Garvey was a 10-time All-Star over his career, including eight consecutive appearances between 1974 and 1981. Topps picked 55 players from their 1977 Topps checklist and issued them in a unique set of cloth stickers that could be peeled and stuck just about anywhere. Each cloth card was nearly identical to the regular '77 card with a few small changes. For example, Garvey's #400 in the flagship set has a blue and gold banner that reads "N.L. All-Stars" across the bottom of the card. However, as seen below, his cloth sticker does not feature the banner. One of the highlights of 2017 Topps Tribute, the Generations of Excellence set features an autograph checklist of 33 retired stars including Garvey. The hard-signed shadowbox design works with a background action shot and a close-up photograph on the left side of the card. The cards also have four numbered parallels for Garvey: purple (#/50), orange (#/25), red (#/10) and black (1/1). Starting with 1971 Topps, each Topps Baseball set included more and more in-game action photos. Garvey got his first action photo in 1973 Topps. 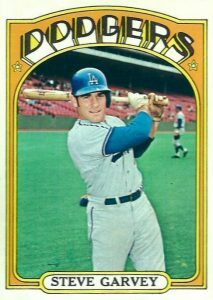 While some action shots made for amazing cards, this Steve Garvey card is noteworthy in that the action nearly blocks the subject of the card entirely. 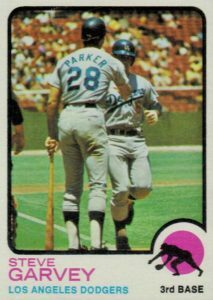 Dodger first baseman Wes Parker (who Garvey would replace at the position) is shown greeting Garvey at home, possibly after a home run, and Garvey's face can just barely be seen over Parker's right shoulder. One of the most unique and odd baseball releases for Garvey is found in 1974 Topps. The horizontal card shows Garvey at the plate with a bat in his hand. While Garvey is in focus, it is the action in the background that makes the card memorable. The faces of the fans in the stands seem to be in motion, with some of them looking almost monstrous. 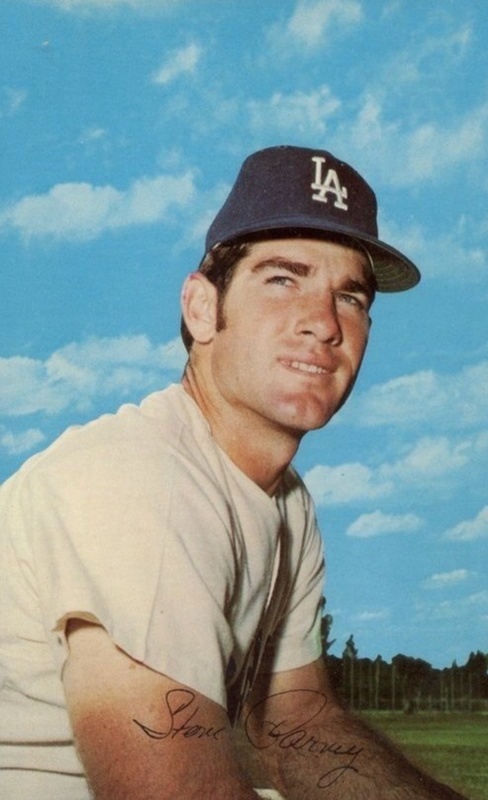 Steve Garvey won the NL Most Valuable Player Award in 1974. As his 1975 Topps Mini card notes, he took home that season's All-Star Game MVP, as well. Along with his base card, Garvey was also featured on card #212 honoring the AL & NL MVPs. He is teamed with Texas Rangers outfielder Jeff Burroughs, the American League MVP winner. 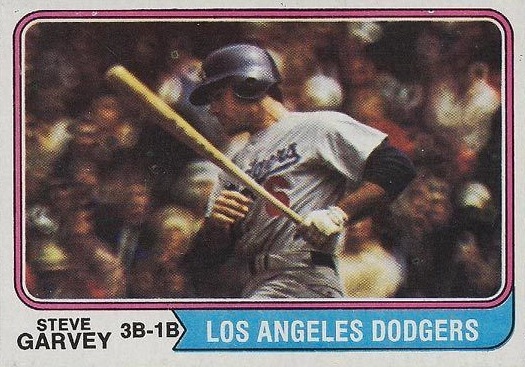 Unlike the 1977 Topps Cloth cards, the images used on the mini and standard versions of the 1975 set were identical. Of all the team-issued sets, the Los Angeles Dodgers postcards are possibly the most popular. The team began putting out the cards in 1959, the season after the team moved to California, and it would continue for more than 15 years. Players would sometimes be repeated from year to year with the checklist changing as transactions occurred. Garvey's 1971 issue shows him as a rookie third baseman. Similar to many others from the set, his card features a bright blue sky in the background. Garvey was featured on the cover of Sports Illustrated several times while with the Dodgers, but it his appearance from April of 1983 that was included in the 1999 Fleer Sports Illustrated set. That particular cover honors Garvey’s National League record by playing in 1,118 consecutive games. The streak would ultimately reach 1,207 games before Garvey broke his thumb during a play at the plate. As impressive at it was, Cal Ripken’s American League record is still more than double the length of Garvey’s NL streak. 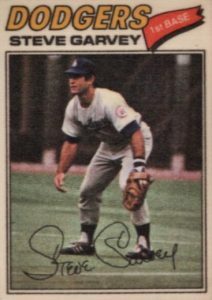 Although there were more celebrated players with rookie cards in the 1970s, few can beat the Steve Garvey rookie card in terms of value because it came in 1971 Topps. The easily-dinged black design makes it nearly impossible to find perfect copies and mint graded copies can top $2,500 at auction. The reverse side of the card highlights Garvey’s time at Michigan State University, where he played football and baseball. 1972 Topps #686 Steve Garvey "High Number" PSA 7 NM, Pristine!